Cocoa butter actually melts at room temperature and that’s what makes it ideal for your skin. Rich in antioxidants, Skin Candy Cocoa Butter adds an enormous amount of moisture to dry spots on the skin, fights off free radical activity …and more. Did you know? … cocoa butter is the fat source used to make chocolate, even healthy chocolate! …. and it’s the cocoa butter that gives it’s alluring, ‘melt-in-your-mouth’, silky texture. The main health benefit of Cocoa Butter comes from its cocoa mass polyphenol. According to a 2014 study published by the Dept. of Medicine and Health Sciences, University of Molise, Italyy; cocoa and cocoa products are important sources of phytocompounds with nutritional and therapeutic value. A growing body of scientific evidence is available to support that cocoa components with antioxidants and anti-inflammatory activities contribute to sun protection and are beneficial for maintaining skin health. How do we get Cocoa Butter from the Cocoa Bean? First of all, the beans are fermented, roasted, and then separated from their hulls. Actually about 54% to 58% of the residue is cocoa butter. Then the butter is deodorized so as to remove its strong taste. Cocoa butter adds scent and smoothness to the skin products. What are the Active Reagents? There are about equal amounts of each. Oleic acid, also found in olive oil, is a heart-healthy monounsaturated fat. Stearic and palmitic acids are saturated fats. It is a pure, edible vegetable fat extracted from the cocoa bean. It is a pale-yellow in color. It is used successfully as a treatment for stretch marks that result from pregnancy. In that it’s full of Vitamins A, B1, B2, B3, C, E, it’s the prefect choice to use as a moisturizer to maintain skin health and encourage the marks to fade. It is often used in treating eczema and dermatitis. Why? When cocoa butter is applied topically, it creates a barrier between the sensitive skin that has been affected by eczema or dermatitis and the environment and this helps in keeping in the needed moisture. Also, cocoa mass polyphenol (CMP) is the substance that prevents the production of the immuno globulin IgE. This is extremely helpful as IgE is known to aggravate both dermatitis and eczema flare ups. 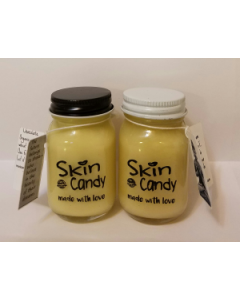 Our latest Skin Candy Cocoa Butter is fabulous. It’s home made, with love, and contains organic cocoa butter, Vitamin E and wheat germ, infused with delicate, uniquely formulated, essential oils. You just scrape a little Skin Candy on your finger, let it melt in your hands and massage into your skin.